Today's tip is a quick little trick for those of you who've bought a hot new skin, but are a little flustered about the brows not matching your latest hairstyle. 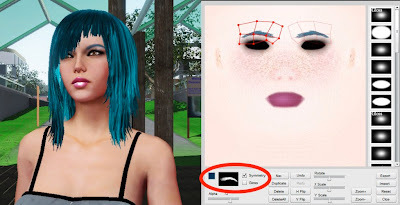 Most skins in Blue Mars right now come with blond or brown brows so wilder colors are usually the most frustrating to match, which is why I'm using a pretty rocking bright blue hairdo to demonstrate this super simple technique. In the face editor, make a new makeup layer, and for the shape pick one of the eyebrow-shaped stencils available. If your skin has no eyebrows at all you can pick whichever shape you like most, but if you're trying to tint some existing eyebrows on your skin, pick the shape that matches the closest. You'll want to make sure Symmetry is checked so your changes to one eyebrow will be mirrored onto the other side, then pick a color close to the hue of your hair (ideally a shade or two darker). This trick will work best with darker colors, so if you're trying to take black eyebrows to blond you might want to settle for a light brown. Now it's just a matter of dragging the red dots around until the shape lays properly over the eyebrows on the skin underneath. 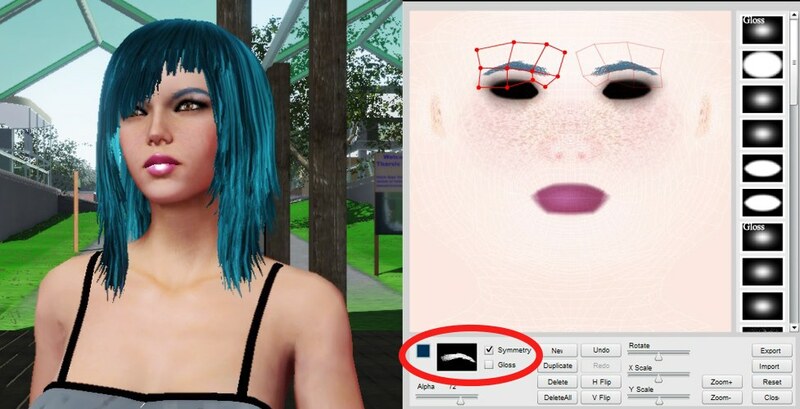 You can play with the Alpha slider until you have the right balance of the brow texture beneath and the brow color layer on top, and voilà! Picture perfect coordinated eyebrows. Got a Martian makeup secret of your own? Share it in the comments, or email me!